This four-country road biking tour is the ultimate journey to explore and get the most out of diverse and culturally rich countries of the Balkans. Cycling through Croatia, Bosnia & Herzegovina, Montenegro and Albania, experience stunning landscapes from towering mountain ranges, deep blue lakes to the idyllic Adriatic coast. Here you will also find remarkable architecture, charming old towns and delicious Mediterranean cuisine. Dubrovnik, Croatia, known for its majestic city walls that overlook the Adriatic Sea, is our starting point for this tour. We cycle along the stunning coastline and head up and around to charming Trebinje in Bosnia & Herzegovina, which is just waiting to be rediscovered by you. Montenegro is the third country of the tour and we cycle along the stunning Bay of Kotor by way of introduction. Explore the alleyways of the fortified medieval town of Kotor before continuing on an epic climb as we ascend the 21 switchbacks of the Kotor Serpentine. This dramatic day ends with a scenic train ride up to the mountain resort of Kolasin. Though we have ascended with the train to 940 m more climbing awaits before a thrilling downhill to the lakeside village of Plav. Soon after we cross into Albania our next climb awaits, as we take on Leqet e Hotit and ascend 6 km with an average grade of 8%. Descending we end at the laid back town of Shokdra and have time to enjoy the cafe culture. It is back to Montenegro to end our tour at the village of Virpazar and a celebration drink on the shore of Lake Skadar. Return home with bragging rights of having cycled through four countries and conquering numerous challenging and iconic climbs. Arrival in Dubrovnik at Cilipi airport. Our team will welcome you and settle you in your Dubrovnik hotel. Meet in the evening for dinner together in town. Riding along Croatia's gorgeous coastline, we begin climbing up and around to Bosnia & Herzegovina. We have an opportunity to stop at Trsteno Arboretum, a garden featured in the hit television series Game from Thrones. We arrive in Trebinje where we will overnight and even have a wine tasting experience. Starting from Trebinje, we cycle into Montenegro and circumnavigate along the Bay of Kotor before reaching the old town. Wander the medieval maze of Kotor and marvel at the historic fort walls. A jam-packed, exciting day lays ahead as we ride up the iconic Kotor Serpentine, taking in amazing panoramic views at each of the switch-backs. Then it's downhill to the former capital of Cetinje and on to Skadar National Park. A late train ride through a deep gorge drops us at the mountain resort town of Kolasin. Depending on how strong your legs are feeling we can ride or transfer up to the Tresnjevik Pass to avoid 900 m of ascending. From the heart of the Komovi mountain range we roll downhill all the way to Plav. This idyllic town is the gateway to the Cursed Mountains (Prokletije), which is shared by Montenegro, Albania, and Kosovo. Relaxing time in this serene setting. Next day, we are at an arms reach towards Albania. We ride uphill to Enver Hoxha's balcony for magnificent views. We have a choice to take a lift to Shkodra or bike flat plains of Lake Skadar to Shkodra. We stay overnight here. We cross back into Montenegro and cycle the southern shoreline of Lake Skadar. We have our farewell dinner here and reflect back on our legendary ride. Today we say goodbye and bid farewell as we transfer you to the nearest airport. Podgorica Airport is 30 minutes away, Tivat Airport is 1.30 hour away and Dubrovnik Airport is 2.5 hours away. Day 2 - Dubrovnik, Croatia - Trebinje, Bosnia & Herzegovina Ride 96km. +1,217m / -961m. This road bike journey takes you along some of the most beautiful landscapes in the Balkans. We cover 522 km in 6 cycling days and have a total ascent of 8,340 m and a total descent of 9,254 m. Our average distance per day for the tour is 87 km with a 1,400 m ascent. Prepare those climbing legs! 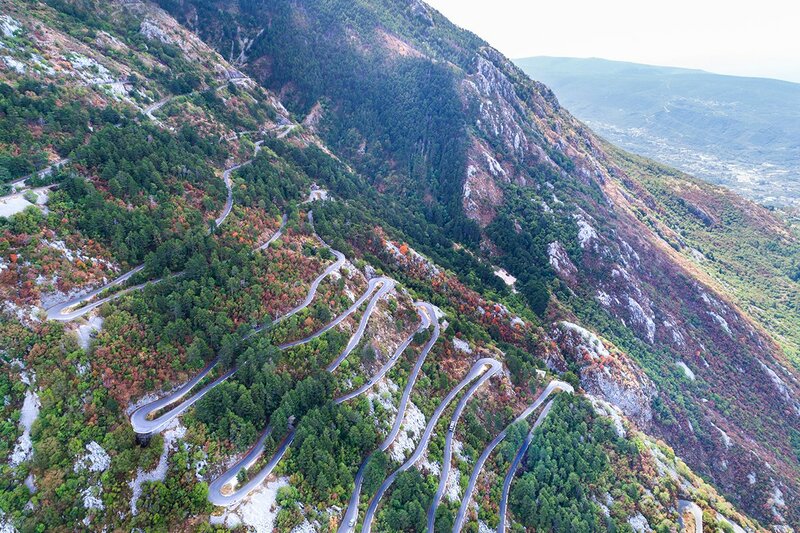 For road cycling purists the highlight of the tour will be conquering two iconic climbs – the Hors Catégorie 21 switchbacks of the Kotor Serpentine in Montenegro and the summit of Leqet e Hotit in Albania, rated as Category 2. Suitability: This is a tour for cyclists possessing a high level of physical fitness and are looking for iconic climbs to conquer. Fitness will be a huge asset on those long days and challenging climbs. The tour is fully supported, and a transfer is always close at hand for those that find the riding too difficult. Biking Conditions: We ride an average of 87 km a day with average climbs of 1400 m. The roads are 100% tarmac and overall in good condition. There will be steep climbs but also some exciting descents to valleys. Arrival at Dubrovnik in Cilipi Airport. Our team will welcome you and transfer you to your hotel in Dubrovnik. Time to get settled followed by a trip briefing. In the evening we head out to the old town of Dubrovnik to have dinner together. We start the day riding along the coastline. We move up north towards Trsteno Arboretum, a beautiful botanical garden known for its iconic appearance as King's Landing from the hit television series Game of Thrones. You are welcome to visit the garden. From Trsteno we climb a side road until Slano where we leave the coastline and continue towards the border with Bosnia & Herzegovina. Right at the end of our climb and already on Herzegovina terrain you will have the chance to visit a magnificent karst cave, the “Vjetrenica.“ From here we follow the old railway line, which once connected Mostar with Dubrovnik and Herceg Novi (Montenegro). Finally, after some serious ascents, we arrive in Trebinje, the heart of Bosnia's wine country. Trebinje is a very nice example of how a typical town in Bosnia & Herzegovina feels like. After a bit of rest, we will go on to explore its charming old town. In the evening we will set out for wine tasting at Tvrdos Monastery which exported its wines to the Austrian court back in the 19th century. Today we ride through the southern half of Bosnia & Herzegovina to the magnificent Bay of Kotor in Montenegro. We have a short warm up before the climbing starts. We'll ascend just over 600 ms in 16 kms but then have a marvelous downhill to the deep blue waters of Kotor Bay. We take a break in picturesque Perast before following the shoreline to the old town of Kotor, a UNESCO World Heritage site built between the 12th and 14th century. Wander the medieval maze of alleyways and marvel at the historic fort walls. We leave the Bay of Kotor via one of the best climbs of the Balkans. The Kotor Serpentine starts at 458 m and 16 hairpin turns and 8 kms later ends at 881m. At the top take in one of the best panoramic views the Balkans has to offer. The climbing hasn't finished though, as we still have to reach 1100 m in the heart of Lovcen National Park before we start our descent to Cetinje, the former royal capital of Montenegro. We have time for a loop around the old town before we continue to another highlight of the day - Lake Skadar, the largest lake in Southern Europe. Depending on time we will end the cycling in the picturesque village of Rijeka Crnojevica or we continue on another 25 km to Montenegro's capital city of Podgorica as we have a train to catch! We'll board the evening train to Kolasin, a small resort town deep in the mountains. The 1.5-hour train ride itself is another highlight of the trip as it offers stunning views as the railway climbs high above the Moraca canyon to more than 900 m! What a way to gain altitude! Sleep well with the fresh air of Kolasin. Today can be a semi-rest day or a full on climbing day. If you feel like having an easier day, we can give you a lift to Tresnjevik Pass, thereby avoiding 900 m of ascending in 27 km. From here it is 43 km to Lim valley with a delightful descent of 1151 m, ending at the peaceful town of Plav. We will make a stop to visit Redzepagic tower, one of the most interesting monuments of defensive architecture in Montenegro. Set on a lake the town is also known as the a gateway to the Cursed Mountains (Prokletije) shared by Montenegro, Albania, and Kosovo. End the evening with a relaxing sundowner amongst the beautiful setting of Lake Plav. Another iconic day! Within only a few kilometres of departing Plav we reach the Albanian border and the climbing soon starts. We ascend for 8 km, almost 400 m, to an altitude of 1,350 m before descending an epic 1,400 m in 30 km. We take a break at Tamara village as our day is far from over. Now we have our next serpentine to conquer, the Leqet e Hotit mountain pass at an elevation of 684 m. Though the climb is only 8 kms long, the gradient is a steep 7% average. Several switchbacks later, we reach a very nice viewpoint called Enver Hoxha's 'balcony', named after the former leader Enver Hoxha who was Albania's mastermind of isolation until the mid-1980s. We roll down once again, cycling close to the border with Montenegro. You will have the option to take a lift to Shkodra or continue biking along the flat shoreline (+35 km) of Lake Skadar to Shkodra. Albania's second largest town it has a nice center and charming vibe. Celebrate your massive accomplishment at dinner! Though the distance may look to be on the shorter side today, we still have lots of climbs ahead of us. We cross back into Montenegro and cycle the southern shoreline of Lake Skadar, which offers some beautiful views of the lake and the Albanian Alps. The first climb comes just aafter crossing the border, then it is a rolling day all the way to the village of Virpazar. We have our farewell dinner at the hotel and reflect back on our legendary ride. There are many airport options to depart from nearby and we can assist you with arranging a transfer to the most convenient one. Podgorica Airport is 30 minutes away, Tivat Airport is slightly more than one hour away and Dubrovnik Airport is almost 2.5 hours away. Since some people can't imagine going on a trip without their own beloved bicycle, we do not provide them as part of this tour. However, you can hire Specialized Allez road bikes for the price listed in the tour pricing section. If you do bring your own bikes, please make sure that they are road bikes and in good mechanical condition. Citizens of the EU, UK, US, Australia, and Canada are among those who do not need a visa to enter Bosnia and Herzegovina for visits under 30 days. Also, Bosnia and Herzegovina now recognizes Schengen visa documents for visits of up to 30 days. To confirm whether you need to apply for a visa, visit the Ministry of Foreign Affairs, Bosnia and Herzegovina. While no vaccines are required for travel into Bosnia and Herzegovina, some doctors recommend getting vaccinated for Hepatitis A and B, as well as for rabies. Visit your medical professional to confirm what precautions you should take. Bosnia and Herzegovina’s weather mostly reflects most inland hilly and mountainous European climates. July and August summers see averages of 25 C while winters around January can get down to around 0 C. As always, the weather is milder along the coast and a bit more varying at higher elevations, which can reach around 2,000 m. Even on the hottest days, temperatures cool down quite a bit at night, especially in the mountains. For the mildest weather with the least chance of rain, June to September may be the best time to travel there. Meals are included as per the itinerary where B = breakfast, L = lunch, D = dinner. The cuisine reflects influences from Eastern European, Mediterranean, and Middle Eastern cultures. There’s plenty of stewed meats and vegetables along with spicy sausages. Make sure to try ćevapčići, spiced sausages or patties served with pita bread and onions. Enjoy seasoned meat, vegetables, and rice wrapped in grape leaves , dolmas, or in cabbage leaves, sarmas. Offal is also a staple in many local offerings. Be prepared for sweet or savoury with uštipci, fried dough, at breakfast. We’ll make sure you get to sample a large variety of local cuisine. Any special dietary requirements can also be catered for as well. Please let us know at the time of booking. Although the official currency of Bosnia and Herzegovina is the convertible marka, Euros are widely accepted, be it on an unofficial basis. So, make sure to keep up with exchange rates if you decide to use Euros! However, there are plenty of ATMs in most towns and resorts that accept foreign credit and debit cards, so you can withdraw cash on the ground. Ask your guide if you’ll be heading into a remote area that may not have ATMs available or won’t accept cards. While no vaccines are required for travel into Croatia, some doctors recommend getting vaccinated for Hepatitis A and B, as well as for rabies. Visit your medical professional to confirm what precautions you should take. With its extensive coastline, Croatia boasts a perfect Mediterranean climate. Summers and springs are warm and sunny, with hotter temperatures further inland. Average temperatures sit around 20 C. Autumns and winters are mild, averaging around 9 C, with potential snows away from the coast and at higher altitudes as temperatures may drop below 0 C. While snow is rare, rain is not, with around 1,000 mm in rainfall annually, mainly in autumn and winter. Meals are included as per the itinerary where B = breakfast, L = lunch, D = dinner. Croatian cuisine is founded in Eastern European and Mediterranean traditions. Along the coast, look for seafood specialties, like brodet (stewed mixed fish served with polenta) or hvarska gregada (different types of fish cooked with herbs, potatoes, and white wine). Eka features lamb or fish being roasted over hot coals, and there’s plenty of hearty stews, cheeses, and vegetables to keep your energy up. Just keep room for kremsnita, a Croatian custard and vanilla cake. And if you’re so inclined, there’s plenty of vineyards featuring local wines to taste, too! We’ll make sure you get to sample a large variety of local cuisine. Any special dietary requirements can also be catered for as well. Please let us know at the time of booking. Although the official currency of Croatia is the kuna, Euros are widely accepted, be it on an unofficial basis. So, make sure to keep up with exchange rates if you decide to use Euros! However, there are plenty of ATMs in most towns and resorts that accept foreign credit and debit cards, so you can withdraw cash on the ground. Ask your guide if you’ll be heading into a remote area that may not have ATMs available or won’t accept cards. Passport holders of up to 70 countries are not required to obtain a visa when entering Albania and are permitted to stay in the country for a period of 90 days. All foreign nationals who have a valid multi–entry Schengen visa, type “C” or “D”, or a valid residence permit in one of the Schengen member states, can enter, stay and transit Albania without a visa, within the validity term of the visa or the residence permit. Please check the Albanian government website for further details. During the summer it is mostly warm, with cool early mornings and temperatures rising to around 25C mid-day and falling rapidly at night in the mountains as the sun goes down. A fleece and long trousers for the evening are fine. Rain is a possibility, therefore you will need waterproofs. Sun cream is a must, as is a covering for your head. Meals are included as per the itinerary where B = breakfast, L = lunch, D = dinner. Albanian cuisine is characterized by the use of various Mediterranean herbs such as oregano, black pepper, mint, basil and rosemary. Vegetables are used in almost every dish. Albanian farmers grow every vegetable present in the Mediterranean region and a farmers market takes place early each morning. Meat (lamb, beef, rabbit and chicken) is used heavily in various dishes in most of the country and seafood specialties are very common in the coastal areas. We recommend that you tuck away a few extra euros for possible incidentals that might arise. It is always wise to have some paper currency in case of ATM absence or credit card problems. This will save you a lot of unnecessary worries. It is also customary to tip local tour guides and drivers; however, the amount you give should be dependent on the level of service you receive. As a general guide we suggest that €6-8 per person per day is appropriate. In just the last year or so ATMs connected to the major international networks have appeared in towns and cities everywhere, which makes travel here much easier. Only the larger hotels and travel agencies accept credit cards, and in only a handful of establishments outside Tirana. Major banks can offer credit-card advances. Every town has its currency market, which usually operates on the street in front of the main post office or state bank. Such transactions are not dangerous or illegal and it all takes place quite openly, but do make sure you count the money twice before tendering yours. The advantages are that you get a good rate and avoid the 1% bank commission. There are currency exchange businesses in major towns, usually open 8 am to 6 pm, and closed on Sundays. The euro and the US dollars are the favourite foreign currencies. You will not be able to change Albanian lekë outside the country, so exchange them or spend them before you leave.